Not surprisingly, there was a total disconnect from reality in the Governor’s State of the State address. 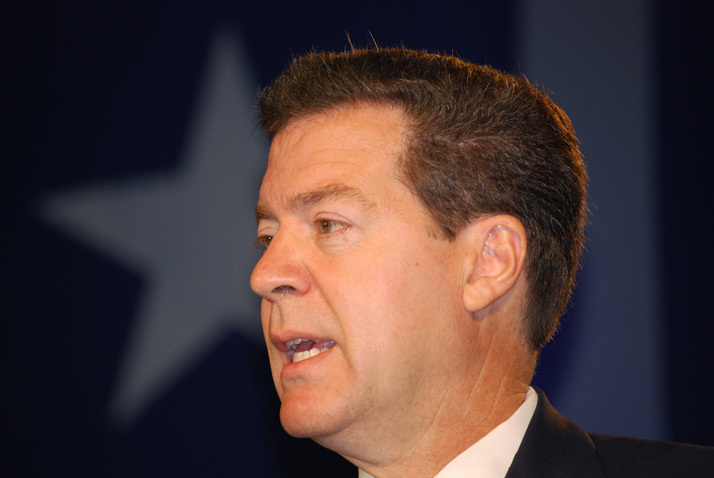 The number one issue facing Kansas is a structural imbalance in the budget, and he never even addressed that issue. His claim that the LLC tax cut is the source of small business growth does not ring true. Trying to increase medical providers in rural Kansas by building a new medical school and dental school while cutting provider reimbursement is just plain crazy. And one must ask, “Just where is the money going to come from to pay for these ideas?” And then his refusal to address the current $350 million budget shortfall but pass it off onto the legislature when it was his tax plan that created the problem…how dare he! While I agree that a new school funding formula is a crucial part of this year’s session, his ALEC-based suggestions for what that formula should include is already a non-starter for most Johnson County residents. More tax money going to private schools, merit-based pay for teachers, outcomes measurements for funding…none of those are ideas that the majority of voters supported in this recent election. It looks to be a year of continued lack of leadership from the Governor’s office and a need for strong leadership from the legislature. The purpose of the State of the State Address is to give the legislature a sign as to what the Executive Branch wants to accomplish for the upcoming Session. I was highly disappointed to hear of the Governor’s continued refusal to expand Medicaid, and his delusional adherence to a tax plan that has plunged the State into fiscal crisis. I was, however, pleased to see a legislature that received his remarks with folded arms and raised eyebrows. I believe that the people of Kansas, and especially the people of Northeast Johnson County, are well-represented. Please do not hesitate to contact us with your concerns as the Session continues. Thank you for allowing us to serve. I think our Governor has had the privilege of not being impacted by the disasters caused by his tax policy, and has no idea what finding “efficiencies” means to the majority of Kansans. Perhaps if he had suffered from the shrinking state services, he would better understand that the children and families of Kansas have born the brunt of our state’s revenue loss: from larger class sizes to more expensive college educations; the inability of Department of Children and Families to protect our most vulnerable kids; the closing of hospitals and the barriers working families face trying to access healthcare as a result of our failure to expand KanCare; and the continued loss of jobs – Kansas lost 4,500 private sector jobs in the last twelve months alone, all of this indicates his policies are not working. Efficiency rhetoric is a slap in the face to every working class Kansan who is paying more as a result of the Governor’s tax breaks for the wealthy, and receiving fewer and less effective services. Kansans sent a clear signal this last election cycle that they are unhappy with the path he and his party took, and this session the legislature must focus on the agenda that matters most to the people of Kansas, no matter what our out of touch Governor says. Last night, the governor’s speech was extraordinary in terms of the disconnect between the reality of our state’s finances, the kind of leadership called for in such times and the policies being proposed. State statute requires the governor to provide a budget that balances based on existing resources – not a budget that balances only if we pass certain new legislation to allow the transfer of fees, sale of state assets, or other one-time measures. Rather than outline the details of his plan, the governor chose to focus on a package of education proposals we have seen fail miserably in other states. In his 2013 State of the State address, the governor boldly proclaimed “Look out Texas, here comes Kansas!” and last night, he proposed a grading system for our public schools that is in place and causing trouble in other states, most notably Texas. This morning as I write this, his actual budget plan is being released. You may find it here. I look forward to digging in to the details. The Governor’s rosy assessment of the “state of the state” couldn’t have been further from the truth. His assertion that his tax plan was working, that it had produced over 60,000 new jobs, that economic development was booming and that he was strongly supporting K-12 and higher education was simply not true. To have him smile and try to gloss over the terrible problems he has created for Kansas, to me, was really an insult to the intelligence of the people of Kansas. The legislature has a tremendous amount of work to do to even begin to repair the damage done by a Governor who seems to have totally lost touch with reality.